Current regulations only require U.S. and European bond mutual funds to disclose a limited amount of information about the risks they have taken using financial instruments called derivatives. This leaves investors and policymakers in the dark on a key issue for financial stability. Our new research in the October 2015 Global Financial Stability Report looks at just how much is at stake. A number of large bond mutual funds use derivatives—contracts that permit investors to bet on the future direction of interest rates. However, unlike bonds, most derivatives only require a small deposit to make the investment, which amplifies their potential gains through leverage, or borrowed money. For this reason, leveraged investments are potentially more profitable, as the gains on invested capital can be larger. For the same reason, losses can be much larger. Derivatives offer mutual fund managers a flexible and less capital intensive alternative to bonds when managing their portfolios. When used to insure against potential changes in interest rates, they are a useful tool. When used to speculate, they can be bad news given the potential for big losses when bets go wrong. 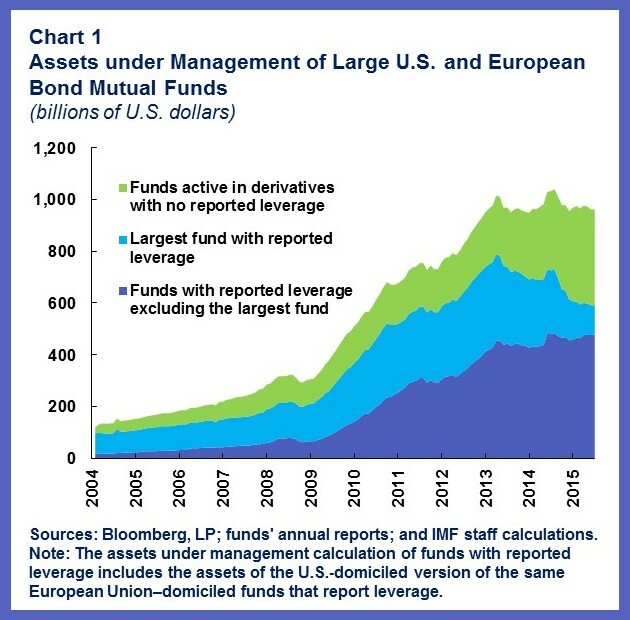 The assets of large bond mutual funds that use derivatives have increased significantly since the global financial crisis. As you can see below in Chart 1, we now estimate they amount to more than $900 billion, or about 13 percent of the world’s bond mutual fund sector. While existing regulations in the United States and the European Union on mutual funds impose clear limits on cash borrowing levels, the amount of leverage that can be achieved through derivatives exposure is potentially large, often multiples of the market value of their portfolios. This may explain why mutual funds accounting for about 2/3 of the assets in our sample disclose derivatives leverage ranging from 100 percent to 1000 percent of net asset value in their annual reports. This range may be also conservative as these are the notional exposures of derivatives adjusted for hedging and netting at the fund manager’s discretion. Although these leveraged bond mutual funds have not performed differently to benchmarks over the past three years, their relative performance has occurred in a period of both low interest rates and low volatility, which may mask the risks of leverage. This is because the market value of a number of speculative derivatives positions could have been unaffected by the relatively small changes in the price of fixed income assets. In addition, limited investor withdrawals from leveraged bond mutual funds may have also masked the risks of fund managers having to sell-off illiquid derivatives to pay for investor redemptions. 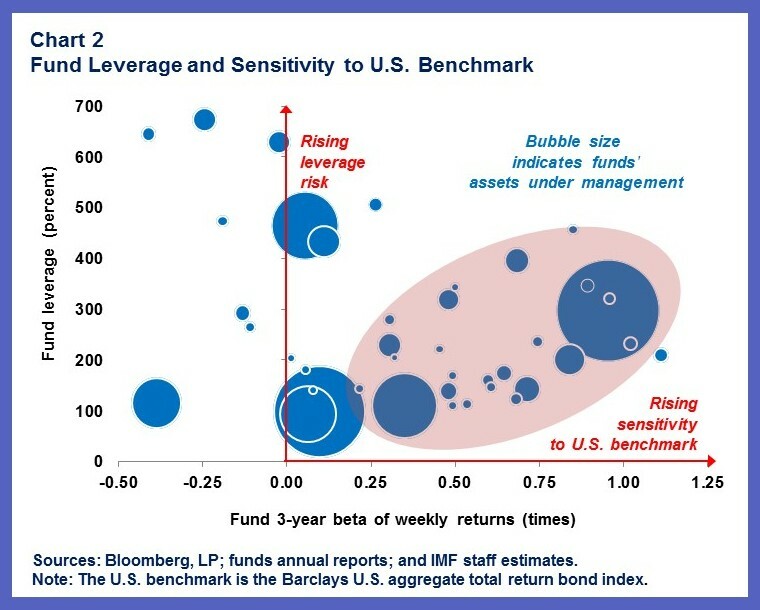 In our analysis we find that a portion of leveraged bond mutual funds exhibit both relatively high leverage and sensitivity to the returns of U.S. fixed-income benchmarks, depicted in Chart 2 below. This combination raises a risk that losses from highly leveraged derivatives could accelerate in a scenario where market volatility and U.S. bond yields suddenly rise. Investors in leveraged bond mutual funds, when faced with a rapid deterioration in the value of their investments, may rush to cash in, particularly if this results in greater than expected losses relative to benchmarks (and the historical performance of their investments). This could then reinforce a vicious cycle of fire sales by mutual fund managers, further investor losses and redemptions, and more volatility. Making a comprehensive assessment of these risks is problematic due to insufficient data; lack of oversight by regulators compounds the risks. The latest proposals by the U.S. Securities and Exchange Commission to enhance regulations and improve disclosure on the derivatives of mutual funds is a welcome step. There is currently no requirement for disclosing leverage data in the United States (and only on a selected basis in some European Union countries). Implementing detailed and globally consistent reporting standards across the asset management industry would give regulators the data necessary to locate and measure the extent of leverage risks. Reporting standards should include enough leverage information (level of cash, assets, and derivatives) to show mutual funds’ sensitivity to large market moves—for example, bond funds should report their sensitivity to rate and credit market moves—and to facilitate meaningful analysis of risks across the financial sector.